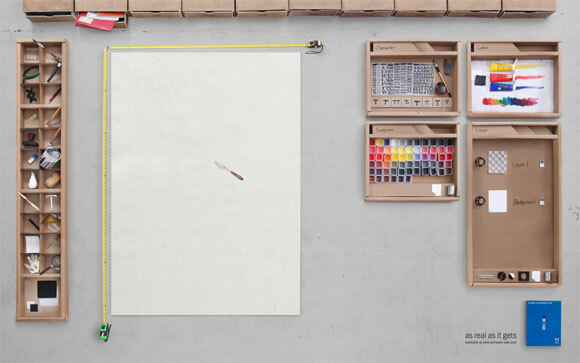 Photoshop CS4 – As Real As It Gets – Brilliant Idea! The front end of Photoshop CS4 in a real world. What a brilliant idea! Here you can see the make of and here the picture in original size. I already downloaded in two days ago but didn’t install yet. On this weekend when I back home, I’ll do an order to try and use it for my pending project. Thanks about this screenshot, Alex! A long time I didn’t buy anything from Adobe. So, do you guys have any experience about Adobe? Do they sell their products in OEM for personal user? Really I like this program it’s an excellent interface! Omg, lol… I though the pic you show us above is new Photoshop’s interface… Well, I’m really disappointed because I was mistake. For anyone who didn’t try Photoshop CS4 yet, here is my screenshot of Photoshop CS4 interface (first time opening;default). I use Photoshop when I was in college, but three years later, I stopped using it. Great screenshot. It makes me wanna use Photoshop again. Wow. Hi Petite, yeah, Photoshop is great, I guess if you start using it, it’s so much fun. I can’t imagine to work without it. Thanks for your comment. Exceptional interface ! It makes me eager to use it. I got a copy a couple of weeks ago but have not installed it yet. There is so much going on I planned on waiting till after the Holidays to learn the new features and what not. I can’t wait to get started though. I actually thought that was the real CS4 interface! I guess that isn’t the case.. come to think of it, I think that as a real interface would be a little too fancy. Aha CS5. How fast will that take? If I’m not wrong, the transition from CS3 to CS4 was pretty fast. Maybe we will get a 3D interface. @CS5 Photoshop, thanks for the link! Wow i liked the pattern, is it real! ?